Use the B-side of Paper 14 for the background (blue & aqua stripes). Remember to set aside the barcode strip for the last layout. 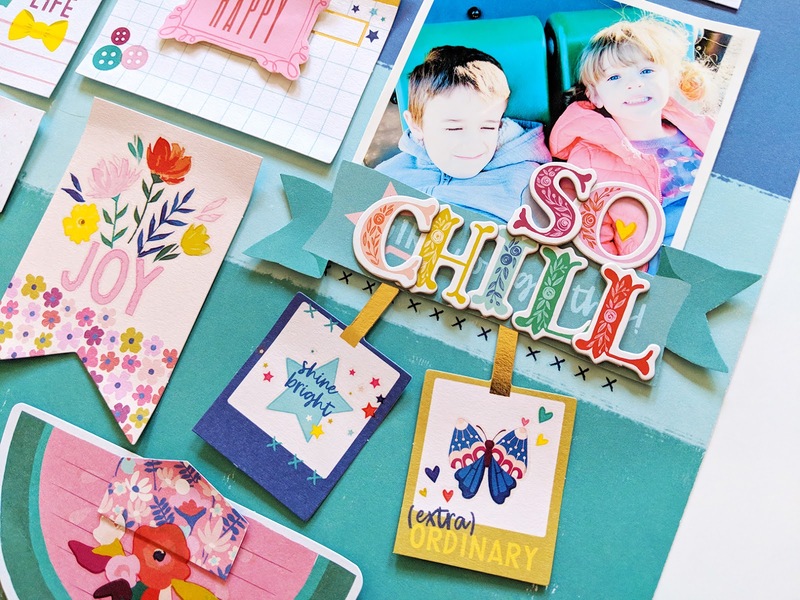 Arrange die cuts from the Journaling Spots pack accordingly, including a 3” square photo on the right side. I bent up the edges and used foam squares for dimension. 1st row – fussy cut a “FAB” sentiment from Paper 13 and add it to the stork card. Apply “stay golden,” a plum, and a few “x” Rub-Ons. Leave the tomato card plain (or truth be told I simply forgot to add anything to it lol). On the flower card, apply a flower Rub-On to the top edge and “x” Rub-Ons to the bottom left corner. Write journaling on hand drawn lines. Fussy cut “Love” from Paper 13 (the whole phrase says “Love much” but I only cut the “Love” part) and add it to the yellow striped card. Apply flower Rub-Ons and tuck a blue tab under the top edge. Stamp the date (stamp not included in the kit) on the tab. 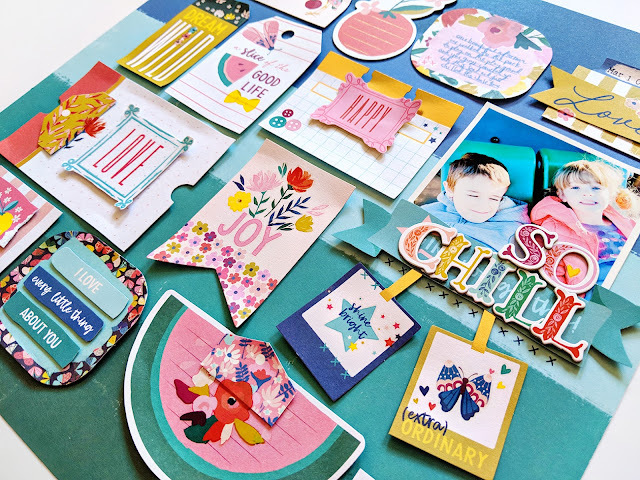 2nd row - cut out the “dream wild” tag from Paper 13 and apply flower Rub-Ons. Apply a moth and yellow bow Rub-On to the “a slice of the good life” tag. 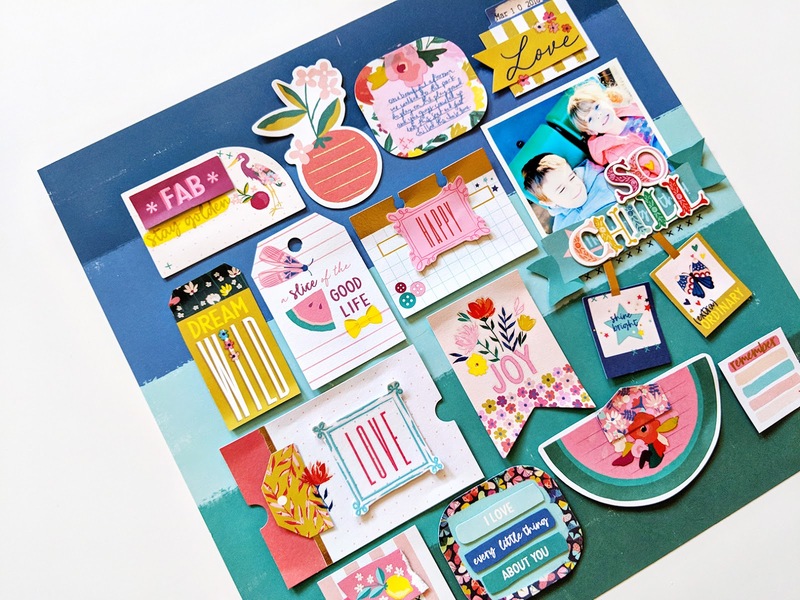 Fussy cut the pink “happy” frame from Paper 01 and add it to the rolodex card. Apply star Rub-Ons to the top right corner and three button Rub-Ons to the bottom left corner. Fussy cut the teal banner from Paper 13, layer it over the bottom edge of the photo, and create the title on top with Chipboard Thickers. Apply a row of "x" Rub-Ons below the title. 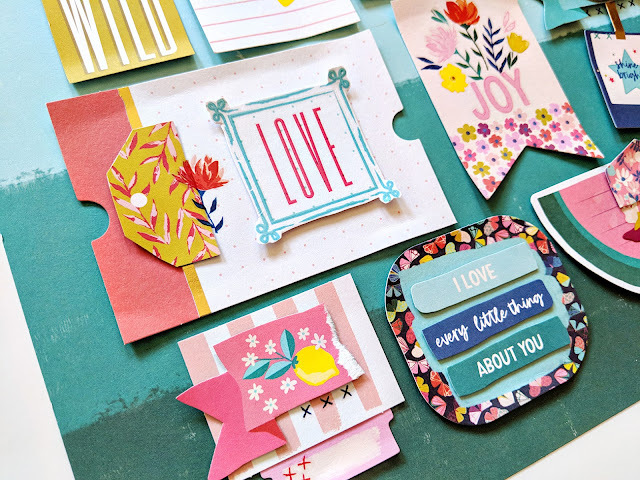 3rd row – apply the “love” frame Rub-On to a white journaling card, fussy cut it out, then adhere it to the red ticket journaling spot. 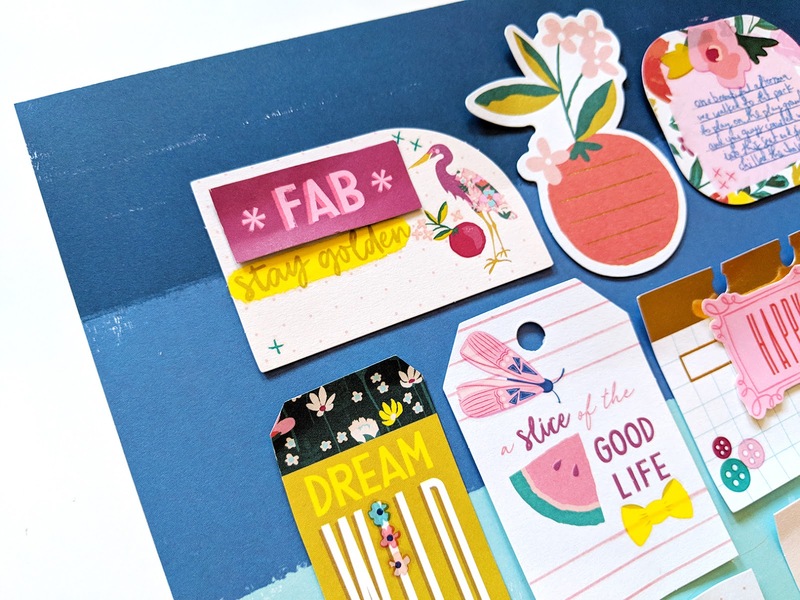 Cut out the top of a tag from Paper 13 and add it to the left edge – apply a flower Rub-On over the left edge. Apply a flower cluster Rub-On and “JOY” Rub-On to the flower pennant card. Apply “shine bright” and mini star Rub-Ons to the blue frame. Apply a butterfly and mini heart Rub-Ons to the yellow frame. 4th row – fussy cut the pink banner with lemons from Paper 13, tear off the left edge, and add it to the pink striped card (save the other half for the 3rd layout). Apply “x” Rub-Ons below and tuck a pink tab die cut underneath. Apply three “x” Rub-Ons to the pink tab. Fussy cut “I love every little thing about you” sentiments from Paper 13 and add them to the moth card. Trim the top of a tag from Paper 13 and attach it to the top of the watermelon card. Apply a flower Rub-On overlapping the tag. Apply two red “x” Rub-Ons to the “remember” die cut card to finish.